Idabel Lake is an amazingly beautiful lake south of Kelowna. While it's minutes from the Big White Ski Resort, and only 45 minutes from Kelowna, Idabel is wonderfully remote and secluded. Apart from disturbing stretches of blocks of logged forest nearby, the terrain almost Hiroshima-like in its imagery. Mobile phone coverage is spotty at best, and television, if at all, is by satellite. Idabel is largely a drive-by lake; people drive by on the way to somewhere else. For those who stop however, there are clear mornings, wonderful swimming and fishing, the joy of peace and quiet and the melancholy voice of a lone loon on the lake. On a clear night the Milky Way is a brilliant display of planets, stars and all sorts of satellites and space craft from our world and others too. The natural audio of the lake in the middle of the night includes owls and raccoons, deer and other mysterious creatures that banged around outside our door at three in the morning. 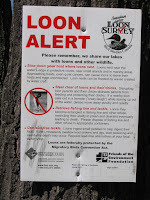 Signs are prominently posted at Idabel offering warnings about loons. These birds might look innocent enough but the recent truth is much more disturbing. 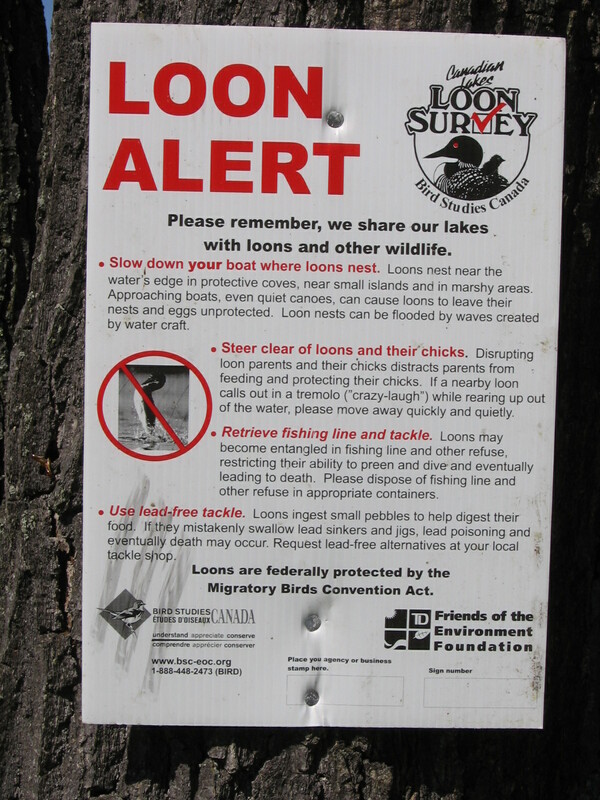 The signs, in plain English, warn boaters to beware of loons. Apparently, and increasingly over recent years, loons have been dive-bombing canoes, kayaks, and row boats with a passion to injure humans within the craft. Many boaters on waters known to be held by aggressive loons, have taken to wearing bike helmets and hockey shoulder pads to protect themselves. We think of loons as being solitary, lonely and peaceful. All Canadians recognise the call of the loon as essential to our very national experience. That experience seems to be changing. Photos by Jeem . Copyright 2015 by Jim Murray.